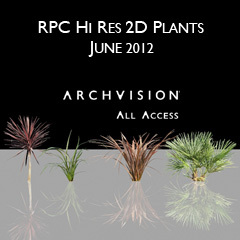 We at ArchVision are celebrating the Summer Solstice with the release of four all new hi-res 2D plants into the ArchVision Content Exchange. This collection is perfect for Summer landscaping projects or a poolside garden. This collection features the colorful tropical Cordyline  native to many Pacific Island countries, Windmill Palm  a short version of this hardy palm tree found in many different regions, Grass  a green grassy vegetation and Grass  a tall grass with a reddish brown tint. ArchVision Software License (Both Node-Lock and Floating License) customers now have access to these four new hi-res RPCs and thousands more. Check out all of the latest RPC Content added to the ArchVision Content exchange by clicking recently added from ArchVision Dashboard. ArchVision Dashboard is available as a free download and provides users a free trial.